In today's article, I'm going to adopt a slightly different format and present content as a starting point for discussion and collaboration, rather than the usual one-way self-contained article designed to disseminate information. Don't worry, there will still be spoilers! For as long as I’ve been playing Shadow Era, terms like "aggro", "control", "combo", "beatdown", "rush", "stall", "solo", "mill", etc. 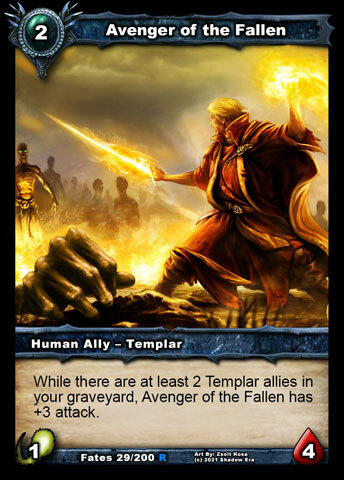 have been used by many many players in an attempt to characterise a particular deck or group of decks. This can be very helpful, but it’s debatable whether some of these are not necessary archetypes, but rather styles or sub-archetypes or variants, and the established classifications from other games may not be the best for Shadow Era due to differences in rules and gameplay either. Ultimately, it’s all semantics, but I think it's worth attempting to arrive at a classification that works well in capturing a player’s options in Shadow Era. In accordance with this, I'm going to present what I consider to be the three main archetypes available in Shadow Era today (which just so happen to fit with three new spoilers! ), and then open it up to the community to assign the various other terms that get used into either variants of an archetype, hybrids of one or more archetypes, or just as a playing style or strategy that can cut across multiple archetypes. If that sounds cool, let's get started! If not, feel free to skip to the spoilers! This is characterised by attempting to win the game as quickly as possible. 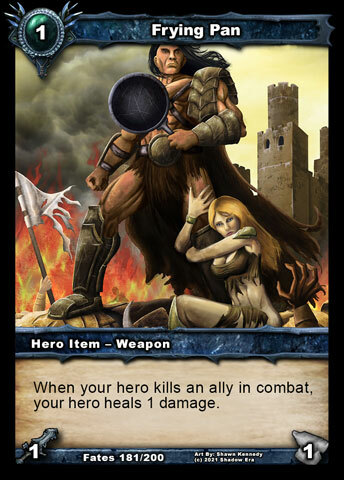 Low-cost allies will usually be involved because they can hit early and then offer value over repeated turns. Other sources of damage will also be considered depending on how quick and efficient they are for bringing the opposing hero’s health to zero. Cards that disrupt the opponent’s ability to deal with the threats presented also tend to show up, but are not essential for the deck to be termed as aggro. Sometimes those cards will be dual-purpose ones that can both disrupt and/or deal damage to the opposing hero - e.g. Lightning Strike . 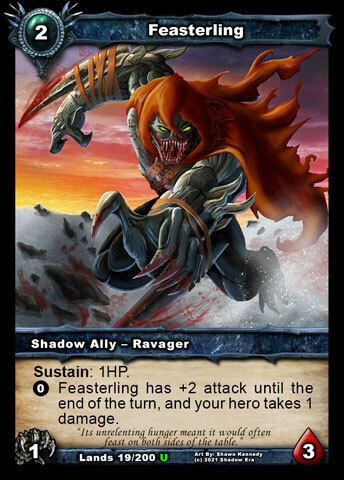 In terms of the design, Feasterling is primarily meant to be Aggro, but the use of an activated ability rather than a passive means that the player can use him more flexibly depending on which archetype they are facing. It also means the opponent has to consider both ways it could be used against them if it is allowed to attack, which can hinder their attempts to confidently take control of the game and deter your offense. This is characterised by using cards that attempt to reduce the value of the opponent’s cards during the early game until a point is reached where the opponent’s ability to win or their ability to not lose to your win condition (or both), has been greatly diminished. In terms of their ability to win, this will usually come simply from them running out of ways to present threats to your own hero and board situation. Board wipes and multi-target abilities tend to show up because of their efficiency, being able to answer multiple cards with a single one. In terms of their ability to not lose, this could be achieved by dropping more expensive threats that the opponent simply isn’t prepared to deal with. An onslaught of high-cost allies is an example of this. Sometimes the win condition will be entirely due to attrition where you have traded blows throughout the game and slowly chipped away at the opponent faster than they have you. This could be in terms of their cards or their hero health or both. 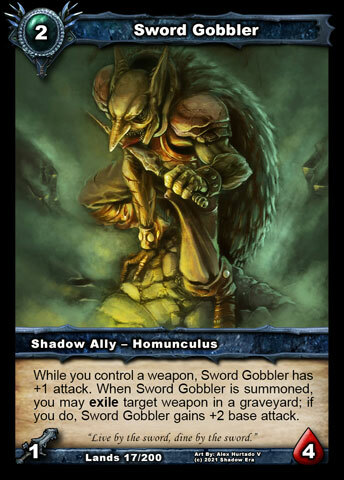 Whilst Feasterling is clearly Aggro, Sword Gobbler can perform in a number of ways for you, including Aggro (e.g. T1 Frying Pan , T2 Sword Gobbler) but I’ve chosen to introduce him here for his ability to grow late game in a similar way that Avenger of the Fallen and Twilight Warden can. As you can see, his growth is dependent on weapons, and it can even interfere with the opponent’s ability to recycle theirs. Whilst not the most overtly Control-oriented ally ever made, I hope you can appreciate where it would help some weapon heroes run a Control archetype. Before I move onto the next archetype, I’d like to highlight the problems caused by dual usage of “control” for both for describing the effect of a card and also an archetype. When used to describe an effect, it’s predominantly within the context of board control, meaning that the effect will improve the board situation for you when you play it: sometimes it will bring about a situation where you are in control; other times it will take control away from the opponent. In both situations, you have played a control card, but the reason for playing that card best indicates the archetype. In the case of Aggro, we have already discussed how abilities like Lightning Strike might be used to reduce the chance that your own threats will be answered and deal damage to the opposing hero. 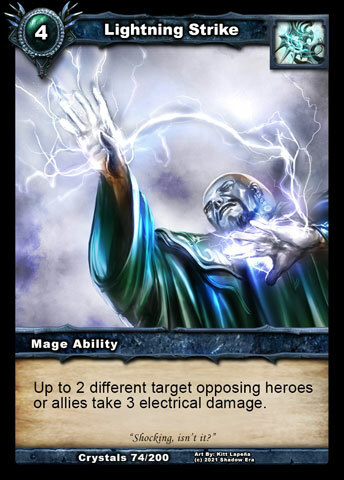 But, at the same time, in a Control deck, Lightning Strike can be used to deal with two opposing threats with a single card. A Combo deck is characterised by its aim to assemble a number of cards either on the board or in hand (or both) that will win the game when their effects are combined. This does not necessarily have to finish the game on the turn the combo "goes off", but that is the ideal for the player. Compared to the other archetypes, you would expect to see a more narrow and unique strategy from deck to deck, where a specific interaction is aimed for. The viability of a Combo deck is a product of three factors: speed (how soon can the parts be assembled? ); consistency (how likely is it that all the parts can be assembled? ); and power (how great will the impact be?). Due to Shadow Era having no interrupts, the viability of the Combo archetype is deliberately restrained by the Design Team which makes it less well-represented in the meta-game as an archetype in its own right. A fast consistent powerful uninterruptable combo simply does not sit well with a game that is meant to provide enjoyable interactive gameplay. Having said that, we very much enjoy creating cards with synergies, which can be combined for increased value, and believe there is a place for Combo decks providing they are not too fast or too consistent or too powerful. This tends to translate into hybrid archetypes of Control-Combo or Aggro-Combo decks rather than pure Combo, which offer more interaction opportunities for the opponent and require the player to pay more attention to what the opponent is doing. Yes, please welcome star of the hit movie, Aldmors Assemble! Sure, he could be used in an Aggro deck for his haste and ambush, but there's a couple of things about this guy that make him particularly suited to Combo decks. Firstly, he's using our new keyword, Seek. 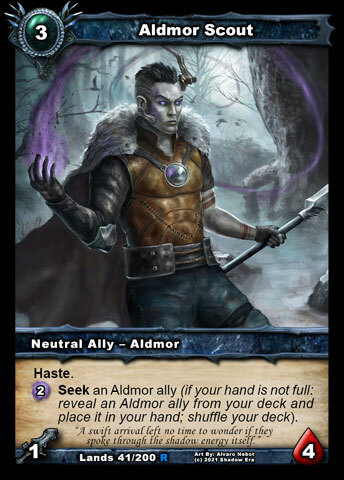 As suggested from the explanation text in brackets, he allows you to search your deck for an Aldmor ally and put it in your hand, as long as there is space in your hand and you are fine with revealing it to your opponent (to prove you didn't grab something else!). When attempting to assemble Combo pieces, Seek can be invaluable. Secondly, he's seeking more Aldmor allies, which fits with lowering the summoning cost of Ancient of Aldmor and also getting value from Aldmor Conflux. 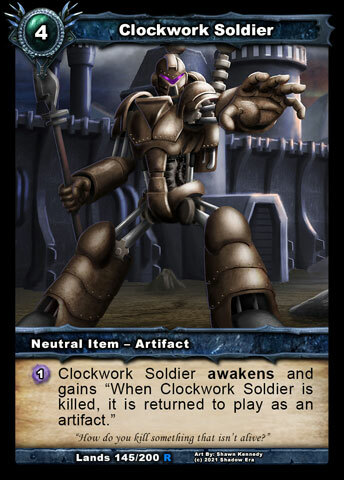 Did you notice that Clockwork Soldier becomes an Aldmor ally when it converts? 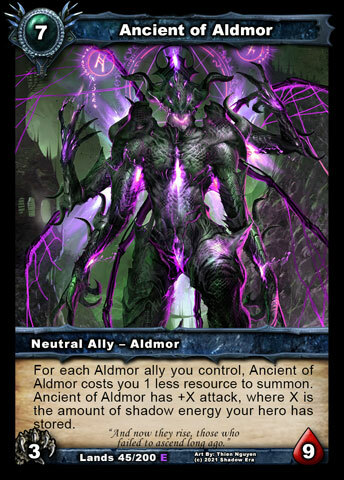 As more Aldmor cards are revealed over the coming weeks, further parts of the puzzle should fall into place, whether it be within a dedicated Aldmor deck or with pieces assembled from outside the tribe. Last edited by Gondorian; 08-07-2015 at 01:16 PM. Well, I hope that was useful or interesting in some way or both. Now, it's over to you guys! Where do you think rush, stall, mill, hand destruction, deck destruction, resource destruction, recursion, midrange, burn, face, weenie, beatdown, solo, weapon fit into all of that? Which are archetypes, which are variants of archetypes, which are hybrids, which are styles or strategies? If you're not so sure on those, I'm also really keen to hear your thoughts on the archetypes and associated explanations I've presented, and, of course, the spoilers, so please do reply if you have something to add to the discussion. Thanks! I kind of feel in the current state of the game that most decks are playing some kind of hybrid control. I'm currently playing a resource destruction/restriction/hand destruction baduruu. A large amount of my games involve me spending all my time controlling the board. 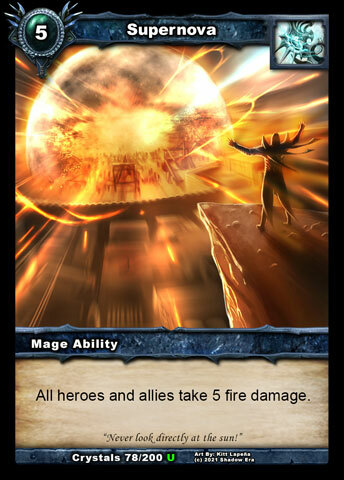 Currently board wipe weaknesses with mages means that agro/rush/burn decks will spend much of their time using their allies/burn cards to deal with the enemy board. In many ways I feel that decks need a lot of varying options to compete so it's hard to build a deck that you could use effectively against a large amount of decks that you would pigeonhole into a specific definition. Only mill/stall comes to mind in that regard. I don't really think it is feasible to build a late game control deck that isn't capable at winning the game by gaining advantage with it's early game allies and control cards. It is certainly feasible to run a late game control deck with no early allies, you've just got to be able to play with absolute surgical precision. A lot of my control builds don't use early game allies, because I don't want to end up taking control and then having no decent win conditions. You have to remember that there is no locking the board indefinitely, so if I'm in a position to close the game, I want to be doing it in the next 3-4 turns, having too many low impact allies makes that difficult. All of these now up on the wiki. Also, the face of Feasterling reminds me of Venom from Spider-Man, particularly the mouth, lol. No one going to help assign other terms to the archetypes? Rush is a variant of Aggro, specialising in cheap allies. 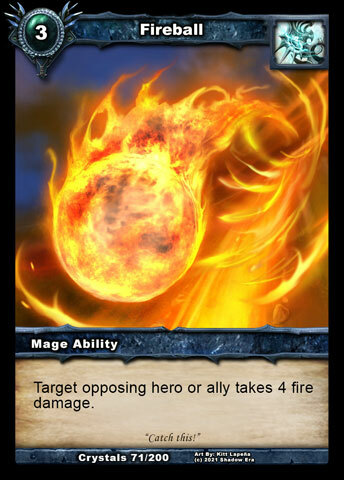 What most call Human Mage Rush (allies then Supernova then double FB for the win) would be Rush and Burn Aggro variant, where all the burn (Fireball , Lightning Strike , Supernova ) can double as disruption to keep your main damage-dealers in play or be used directly to take down the hero's health. Mill is a variant of Control that works both for the control element (put their cards directly in grave to avoid even having to deal with them on the board) and also the win-con (out of cards means empty deck damage and hopefully few threats left to oppose your own). Stall is a variant of Control where there is no win-con other than by attrition, which means the game can drag on and on til completion or the opponent manages to find an opening. Don't confuse with "stall" cards which could also be called "control" cards, which simply neutralise threats for one or more turns, because the aim for a Control deck is usually to slow the game to later hit with an offensive Control win-con. 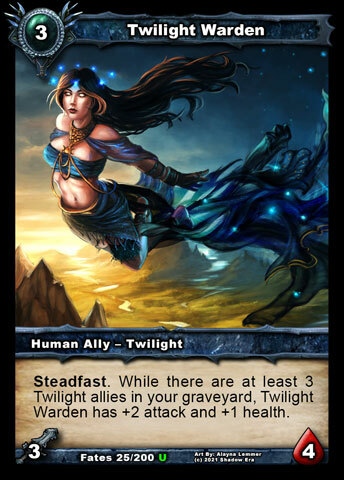 If a deck has lots and lots of stall cards, then it is probably a Stall Control deck and not really something we love in Shadow Era. Face is a variant of Aggro where you have no disruptive consideration at all and every card is aimed at dealing damage directly to the opposing hero (their face). How am I doing here? Anyone wish to help out? Once we get something looking reasonably decent, I think this would be great for adding to the official wiki. I would not be happy if I played Control and was forced to play Sword Gobbler . It does nothing when it enters, it does not control the game and it's not a win condition. Why would I ever want to play that thing? I can think of one reason but I'm pretty sure there isn't going to be anything that's a 1cc "Draw a card, discard a card" so I can get a on-curve 2cc 3/4. Aldmor Scout seems interesting if the rest of the Aldmor gang are good. You could play like ~10-11 guys with 3 Scouts finding the rest so you can spend more cards and time making sure your opponent's cards do as little as possible. Is it a good Combo card? Probably not. Nothing when it enters for an ally with an on-summon? Actually could be extremely powerful early (which is why I'm exactly sure why it was categorized under "control", as it seems a little more aggro to me. T1 Frying Pan , attack to put it in graveyard, T2 Gobbler exiles the Pan to become 3/4, then play a 3cc weapon on T3 for a 4/4 that can attack on T3. Seems kinda aggro to me, and decently useful in the right deck. Obviously isn't for every deck, since not all would run so many weapons, but could work well for the right deck.